What else can I try besides gas drops and gripe water? What do you do when nothing seems to get rid of your baby's gas? Few things are more frustrating than a screaming, gassy baby. And sometimes it feels like gas drops and gripe water aren't really making much of a difference. If you're like a lot of parents in this situation, you're asking whether you are doing something wrong. Or maybe you're just starting to feel like there's no way out of this colicky mess. But there are other things you can try (like probiotic drops!) Gas drops and gripe water are not the only ways to deal with gas. In fact, science tells us that they aren't even that good at fixing gas! Most gas drops use an active ingredient called simethicone. Theoretically, simethicone helps baby gas by acting as an anti-foaming agent. It supposedly gathers gas bubbles together into a single big gas bubble. That way your baby passes the gas quicker. At least that's how it's supposed to work. But in reality, simethicone isn't any better than a placebo. So if your baby's gas drops use simethicone, your baby might not be getting much gas relief at all! That being said, simethicone gas drops do tend to make baby's happy. But the science indicates the babies are happy because the gas drops taste sweet. The gas pains are not actually going away; the baby is just getting distracted. That's not a bad outcome most of the time, but if your baby is dealing with awful gas, it might not be enough. Homeopathic gas drops (like Hyland's Baby Gas Drops) are even worse. The science indicates that they are no more effective than placebos. Plus, homeopathic baby gas drops can actually be dangerous. So they really are not good options for getting rid of baby gas. But what about gripe water? Well, it probably doesn't really relieve gas either. Once again, babies get distracted by the taste. No actual gas relief seems to be happening here. So what does help? If gas drops and gripe water are both ineffective at getting rid of baby gas, what can be done? We are big fans of probiotic drops (which you can buy here.). Probiotics help babies (and adults too!) with digestion. Multiple studies indicate that probiotics are effective at reducing and preventing infant gas, even when compared to a placebo. And giving probiotics to babies seems to be completely safe. So this stuff actually seems to work! That being said, you should be aware though that probiotic drops are not an instant cure. Your baby may become less gassy after regularly taking the drops, but you probably won’t see the immediate turn-around that the other (sweeter, but less-effective) gas drops provide. But the probiotics offer a real, long-term solution to baby gas. So if nothing else it working, give this stuff a shot! It’s time for a confession: I go a bit too far with my thriftiness. An average visit to the grocery store for my family involves coupons, a well-marked pamphlet of “weekly deals” and a large quantity of BOGO purchases. When it's time for a night out, I look for restaurants that give away free food with an email list subscription. I once went to three different restaurants for food on my birthday because each gave away a different “birthday gift” meal. (Put it in the fridge and save it for later!) I’m a savings addict. But when it comes to my children, I have to splurge just a little. This doesn’t mean that I don’t look for deals (and free stuff! ), but when it comes to baby products, you sometimes have to look beyond the price tag. The best value is not necessarily the cheapest product; some products are truly worth the price. Items made from bamboo fiber tend to fall into that category. If you don’t know already, bamboo fiber is incredibly soft. The material feels as smooth as cashmere. I remember the first time I used a bamboo towel; I had no idea that drying off after a bath could feel so good. In fact, this stuff feels so good that I would probably never buy it under normal circumstances. After all, luxury and frugality rarely mix! But bamboo fiber isn’t just nice to touch; it’s both eco-friendly and baby-friendly (two terms that matter a lot in my house). Bamboo is so much better for our environment than cotton, and the natural gentleness of the material makes it ideal for infant skin. Bamboo re-grows incredibly quickly after being harvested, which makes it surprisingly renewable. In fact, bamboo is so good at re-growing that it’s annoying; people try to rid bamboo from their backyards only to find that even more bamboo grows back. This might be bad for homeowners, but it’s great for eco-friendly textile producers. The quick bamboo regrowth ensures that we aren’t using up a limited resource. Additionally, bamboo is great for land-usage. And that's good news because land usage is a more important environmental issue than you might currently think. Bamboo is so good at this that some have called for wide-scaled use of bamboo in restoring forests. That's right; this plant is so eco-friendly that we might use it to reverse the environmental damage of deforestation. To make things even better, Bamboo has been labeled “CO2 Neutral.” One paper even notes that bamboo has a “positive impact on climate change through carbon sequestration.” If you are looking to reduce your carbon footprint, you can’t do much better than using bamboo products. Put simply, bamboo is environmentally friendly. You can feel good about using bamboo products. Eco-friendly products are far too rare in the marketplace, and high-quality products are even rarer. But bamboo fiber takes care of both of these problems. Unlike cotton, bamboo fibers are naturally rounded, which means that they need no chemical treatment to be comfortable. The roundness of the fibers is what makes them so smooth. When you feel bamboo cloth, you aren’t dragging your skin over course, irritating spurs. Instead you feel gentleness. This gentleness is particular important for babies. Infant skin is delicate. Your adult skin can feel the difference between bamboo fiber and cotton; imagine how clear the distinction is for an infant. With bamboo you avoid the abrasive drag of cotton. And that can only be good for your baby’s skin. We love bamboo fiber. Bamboo fiber products tend to be high quality and gentle. Plus, buying bamboo fiber means you are making an eco-friendly decision. Some products are just worth the extra money. What's the difference between gas drops and gripe water? Gas drops and gripe water claim to do the same thing: solve your baby's gas problem. So what's the difference between the two products? And does it matter which one you give to your baby? In this article, we'll compare and contrast gas drops and gripe water. Gas drops usually refer to products that have simethicone as an active ingredient. Simethicone-based products make up the majority of gas drops on the market, including: Alka-Seltzer Anti Gas, Colic Drops, Colicon, Degas, Equate Infants' Gas Relief Flatulex Drops, Gas Aide, Gas-X, Genasyme, Little Remedies Gas Relief Drops (or also called Little Tummies), Maalox Anti-Gas, Major-Con, Micon-80, Mylanta Gas, Mylaval, Mylicon, Mytab Gas, Phazyme, SonoRx, and more! All of these gas relief products are essentially the same thing with different presentations. But sometimes they have different flavors, which might matter more than you think. Simethicone-based gas drops really do make babies cry less, but it's probably not because the simethicone does anything to help gas. In a scientific study, simethicone performed no better than a similar-tasting placebo in treating gassy babies. So, it's the sweet taste, not the simethicone, that makes the babies happy. And the taste really does calm the babies down! So, gas drops may not decrease gas, but they do make your baby feel better. We used simethicone-based gas drops with our daughter, and they helped a lot. 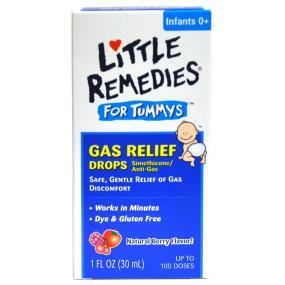 Little Remedies Gas Drops were our favorite. But like we stated above, it really doesn't matter much which you choose, as long as your baby likes the taste! Gas drops can also refer to homeopathic gas drops, which don’t really have an active ingredient. Homeopathic drops are “alternative medicine” that do not rely on mainstream science and thus contain no actual medicine (at least not according to the traditional definition of the word). However, because the sweet taste is what really matters here, homeopathic gas drops may perform just as well as anything else. However, unlike normal gas drops, homeopathic infant gas drops might be dangerous for your baby. So we cannot and do not recommend that you try homeopathic remedies to help your gassy baby. Gripe water is a "natural" remedy for infant gas, usually made from a mixture of baking soda and herbs. That being said, there is no single way to make gripe water; different brands have different formulas for gripe water. The reason for all the different formulas is that gripe water used to be made from alcohol and sugar, which is no longer considered acceptable to give to babies. So now gripe water manufacturers have to come up with new recipes if they want to keep selling their products. These days gripe water manufactures market the product as a natural, herbal remedy. But it's not the herbs that make gripe water so effective with gassy babies. Just like with gas drops, babies simply like the taste of gripe water. So babies really do calm down after drinking gripe water, but not because the herbs do anything to help the gas. It's all a matter of taste. Unfortunately, too much gripe water can be harmful for babies. Since most gripe water recipes contain baking soda, taking too much gripe water can lead to alkalosis or milk alkali syndrome. That being said, this probably will not happen to your child (because most parents don't go overboard with gripe water). But you should be aware that gripe water is not always harmless. And if you decide to use gripe water on your baby, stay away from versions of the product that use alcohol. Gripe water and gas drops are completely different products, but they treat gassy babies in the exact same way. It's all about distracting the baby with something sweet! That's not what the products advertise, but it seems to be what's really happening. That being said, we still think gas drops are worth using. A baby that stops crying is baby that stops swallowing air, and that probably does help with gas. And a happier baby certainly makes for a happier home! It's hard going to church with an infant. Although we parents may enjoy getting out of the house and having some adult conversations (something parents don't get nearly enough of! ), your baby might find a lot of the noises in church to be unsettling. And that's when the screaming starts. It's frustrating to get some actual adult time only to have it cut-off by a screaming infant. This is especially true when your baby doesn't really want anything at all except your attention. Luckily, we found a good solution: noise-protection ear muffs. It sounds weird, but here us out. This is a way to get your baby to go to sleep during church, and it's a game-changer in terms of actually enjoying the service. Most noise-protection ear muffs don't cancel out all noise; they muffle noise. And that's what you want for baby during church: something that filters the noise and makes it less scary. We really like the Pro For Sho Ear Muffs because they create something similar to white noise. And that will put your baby right too sleep. So instead of dealing with an antsy hellion that can't deal with all the noisy stimulation, you have a sleeping angel. And now everybody's church service is better. Pro For Sho sent us two pairs of the Ear Muffs to try, and we fell in love. The Ear Muffs are adjustable, so they fit well regardless of head size. And they are surprisingly light, which is great. Plus, they're just comfortable (which probably also helps with the sleep!). So we 100% suggest you get some of your own if your baby tends to be vocal at the worst times. It makes life so much better. And honestly, you'll be surprised at just how inexpensive the ear muffs are. I wish we had purchased these a long time ago. But at least we have them now!